You will find contact information for over 160 different things to do in Nanaimo, from Air Cadets to Windsurfing. Just a few of the interesting contacts you will find are, air cadets, art galleries, baseball, birdwatching, bowling, boy scouts, ceramics, chess club, computer club, Clipper's Hockey, 4x4 club, 4-H club, fish and game club, flying club, football nanaimo, girl guides, gymnastics, hang gliding, horse riding, kayaking, kennel club, service clubs and many more. If you can't find what you are looking for, drop an email to admin@nanaimo-info.com and I will do my best to find the information. 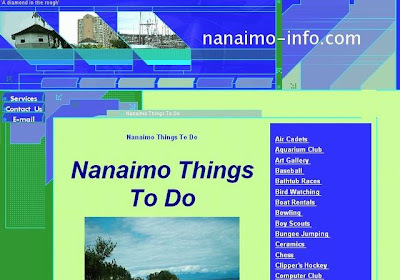 To view 'Things To Do in Nanaimo' click here.